On this Memorial Day, I'd like to draw your attention to a set of remarkable photos taken a few years ago by a reader (Katie) and her husband, who were formerly stationed in Germany. 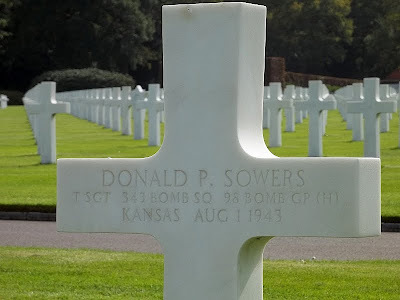 Katie learned that Don's uncle, Donald Sowers, who was killed in World War II, was buried in Ardennes American Cemetery in Liege, Belgium. She and her family visited the cemetery and sent these photos. I searched for 2 years to find my mother's first husband Harold Norris, killed 4/4/44 @ 2:04 PM over Romania. I received a photo of his grave from Belgium and walked over to my mother's home and said, "Mom where is Harold buried?" She said, "New Jersey". I said, "Mom, sit down, we need to talk." Her mouth dropped open when she learned that her first husband was buried in Belgium! He has been there for (then) 65 years. All I started with was his purple heart, his name and service number. It has lead me down a path filled with new compassionate friends and a new understanding of the word sacrifice. Harold was an airman, navigator and top turret gunner. His plane the Miasis Dragon was shot down after delivering a fatal blow to an oil refinery in Bucharest Romania. The plane was hit at the waist by a land-to-air missile. The plane nose dipped, the pilot pulled it up, then it went nose-over-tail to the earth in a fireball. 4 crew were "carbonized" and were buried together in one grave by Romanian Monks. Later, in 1949, with dental records my mother provided, the US was able to locate his remains from the others and he was buried for the 9th and final time in Ardennes. The other 3 airmen are still together buried in the US. One of the beautiful things I noticed was that each man's life is symbolized with a marble cross. 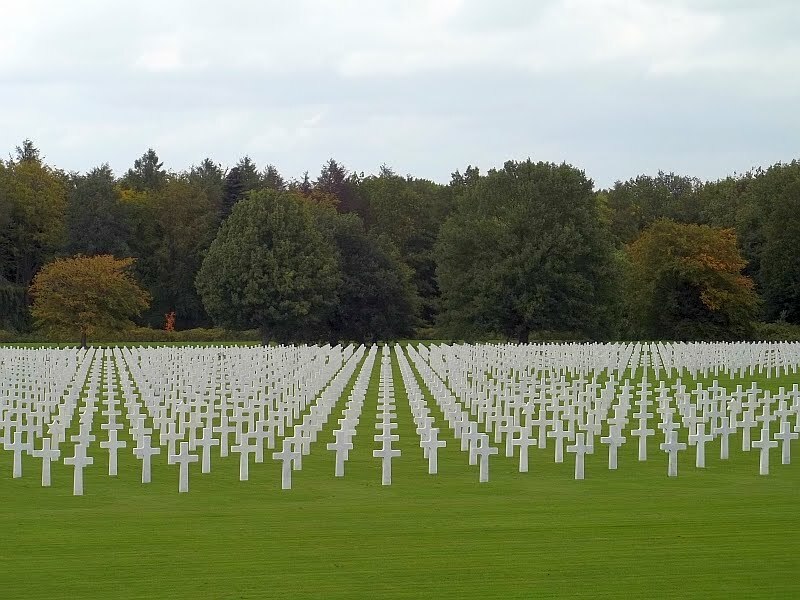 They all worked and sacrificed as a group and from above, all of their individual crosses make up a larger cross. This collective larger cross can only be seen by people in airplanes and God. 3/5ths of the graves hold the remains from airmen who lost their lives....it is to those who fly that the larger cross is visible...a beautiful way to honor them. The other thing I learned in 2010: the people of Belgium, France and other countries meet and honor our heroes. 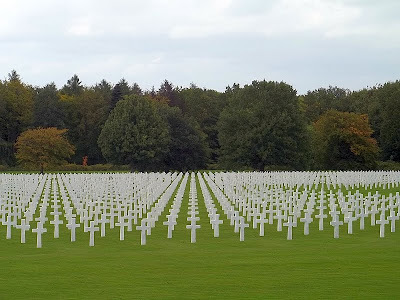 At Ardennes in 2010, there was approximately 100,000 people present, not many were from the USA. It seems that in life, we considered these men to belong to us, but in their death, the European people consider that these men belong to them, whom they thank and honor every year. Most graves have been adopted. Harold's grave was adopted many years ago and now the lady who adopted his grave is teaching her young grand daughter to care for it. She obviously does not want her grand daughter to forget the gratitude she has for the men who lost their lives saving hers. A mighty "thank you" to our past and present veterans, whose sacrifices too many of us are willing to overlook, dismiss, or forget. Back then, they wanted our help. Back then, we didn't fight wars unless the safety and well-being of the people were at stake. We certainly didn't fight wars for corporate interests, back then. We didn't throw rocks at our soldiers back then. I honestly wonder if there wasn't less PTSD, because back then we accepted that war was hell, and didn't tell people to shut up and get that chin up. I was talking with my grandmother this afternoon. Who else remembers that Memorial Day used to be called Decoration Day, and that it used to be about gathering together to remember the departed (and not about big sales, new grills, and plenty of alcohol)?? I note that most of the veterans I know these days (Vietnam, Iraq, and Afghanistan) prefer fireworks and alcohol to memorial day honors services with political keynote speakers. We cooked hot dogs with the kids. I showed them how to make a fire with crumpled paper for tinder and no propellant. We talked about how hard it is to use grass for tinder, and how difficult this would be with flint and steel, and how hard it must have been for our ancestors to get fire. We talked about the people that are gone. Yeah, I think we were better then. I just got to keep trying harder to be the Old People. Patrice still remembers. How many others? ?